You might have thought that the buzz on campus about Greek Life began and ended with the Betagate. 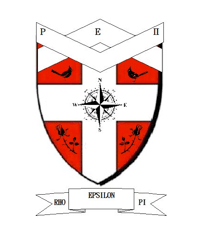 Samantha Pop ’11, Grace Zimmerman ’13, Lucy Finn ’14, and Melody Oliphant ’13 have decided to prove otherwise with the formation of a new sorority on campus, Rho Epsilon Pi. Now, your head may be spinning with the notion of fanciful tales of brothel laws in Connecticut and the like. But if you’re interested in participating in this group, or just curious about what a sorority at Wesleyan might look like, then join us this Thursday at 9 p.m. in Albritton 311 to find out more information! More info about the impetus behind this new sorority on campus after our crest and the jump! The mission of Rho Epsilon Pi is to cultivate the creativity, knowledge, and spiritual illumination of its members through a perpetual bond of friendship and sisterly affection to develop strong, passionate Women with a commitment to leadership, moral integrity, and community service for the betterment of the individual and the world. And as a female at Wesleyan, I’ve certainly felt that our campus does not provide a comfortable, approachable social setting for girls to socialize with other girls, or meet girls of different ages. It seems as though the only way to obtain that opportunity is through playing on a sports team or being involved in a club. And for women on this campus who don’t participate in those activities, it becomes nearly impossible to form close bonds with older girls, or with girls entirely. More than that though, our campus social scene seems driven by men on this campus and largely dependent on fraternities, whether we’re talking about parties, formals, concerts, etc. So, a few of us wanted to create an equally welcoming environment for women on this campus. In that vein, we’ve decided to start Rho Epsilon Pi. Our sorority is not part of a national chapter, and therefore presents us with the opportunity to shape it into whatever we, as women on this campus, want it to be and give it a distinctly Wesleyan feel. So, whether you’re a freshman, senior, or somewhere in between, come join us this Thursday to learn more! Posted by Melodious in Campus Life, Events, Student Groups and tagged greek life, Rho Epsilon Pi, sorority on March 22, 2011 at 5:15 PM. Hi were looking to have a collage night at our Bar and Lounge every Wednesday. We had an event this past Wednesday with 300 plus of students from your collage and the owners were impressed. I think it’s awesome so good work, ladies. additional generic opinion about something that doesn’t really concern me!! That was Rot Adamstein. Just sayin. I am all for this, way to go Moliphant! Something needs to be done about that crest ladies. That is a monstrosity. Are those Cardinals ClipArt? Why is joining a sports team or a club so difficult? Almost everyone at Wesleyan has an extracurricular passion, and it’s through that, like you said, that we create close female bonds. Also, are the two co-ed frats/societies not considered a place where women can bond? I love that Wesleyan doesn’t have sororities and I love that Wesleyan is moving faster than most schools toward being completely co-ed–it creates such an awesomely unique vibe on our campus. A sorority seems to be the opposite of everything I love about Wes. I fully support the administration’s stance that no houses will be turned into new Greek housing. co-ed, not quite. plus, what if you’re not a hipster or social inept? You clearly didn’t RTFA. Go back and read it, then comment. if anything, this will contribute to the co-ed feeling on campus. as of now, athletic greek life isn’t co-ed, and this will hopefully equalize the dominance males have over the social scene. If you didn’t come to wesleyan for sororities, then there is no pressure for you to join, however, the addition of this entity will surely be something others love about wes, while not affecting you. First Westco gets spine and restores Zonker Harris Day, now people are organizing new Greek societies on campus. Am I dreaming? yes. wes has a policy of gender non-discrimination for any school sponsored club/organization. de facto of them holding the meeting on campus they are a school organization and can therefore exclude no one. Join the sorority. do it. I think this sounds lovely, actually. Good luck! I hope it takes off.